A 5 MW project in Pennsylvania is now up and delivering PV solar power, thanks to thesupport—through SRECs—of a number of educational institutions and the Philadelphia Phillies. In an area of Pennsylvania known for its rolling hills, small farms, and an Amish population with their aversion to technology, a 5-megawatt solar farm may seem out of place. 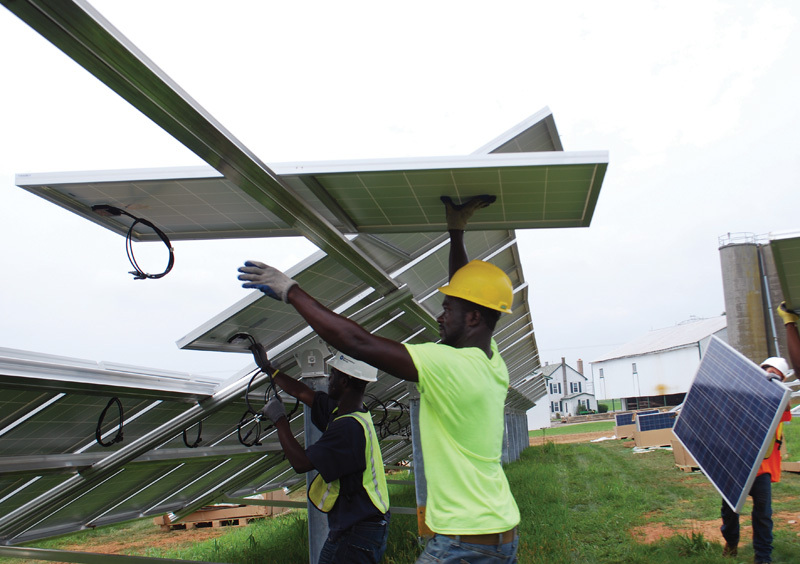 But by cultivating relationships that resulted in mutual respect among all parties, Community Energy Solar LLC (an arm of Community Energy Inc. based in Radnor, Pennsylvania) was able to win over township leaders and secure the needed permits to complete the Keystone Solar Project, said Tom Tuffey, Community Energy's vice president of project services. 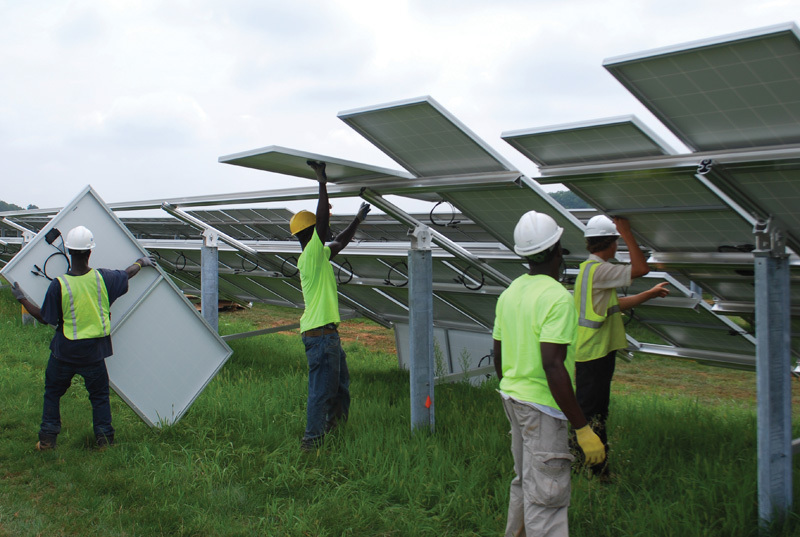 The project did come with concessions—most notably techniques to not only preserve, but actually improve, the farmland on which it was built and an escrow account to pay for decommissioning and removal of the PV system after the project's lifespan. An innovative financing approach that paired educational modules with institutions that wanted to voluntarily support renewable energy helped bring the project to fruition. The special steps Community Energy Solar took didn't go unnoticed. The PV America 2013 East Conference named the Keystone Solar Project one of three Projects of Distinction for 2013. More than 150 projects from east of the Mississippi River were submitted for consideration. Tuffey said they decided to develop the Keystone Solar Project in Pennsylvania because it was the company's home state and central to its mission to expand solar generation in the northeastern U.S. The state also had Solar Renewable Energy Credits (SRECs) and solar-development incentives. The firm narrowed selection to sites served by utilities PECO or PPL Electric Utilities and sites that had good interconnect capacity. The site chosen was an 89-acre former dairy and poultry farm near East Drumore Township in Lancaster County that had been in the Kreider family for generations. At the time, it was being rented to a local farmer for field crop production. 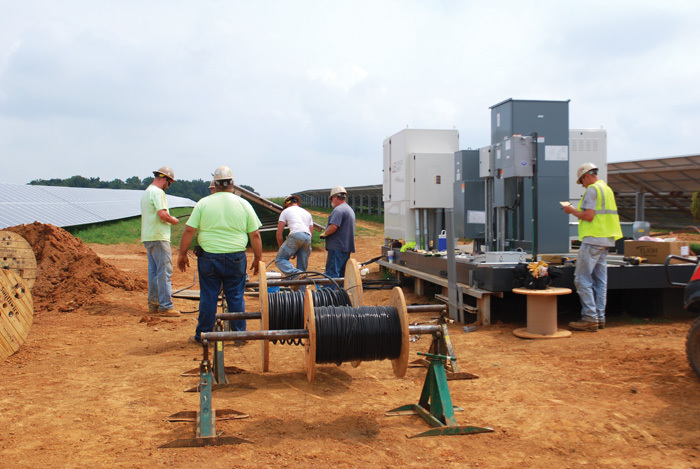 A number of educational institutions have purchased voluntary SRECs related to the Community Energy project in Pennsylvania. Professional baseball team the Philadelphia Phillies has also signed on. In fact, the team's mascot—the Phillies Phanatic (above)—was at the Turn on the Power Party, which celebrated the project's completion. Utilizing the site in southeastern Pennsylvania required very few upgrades to the distribution system and none to the transmission system, said Steve Hazel of Community Energy. Because the land was zoned agricultural, Tuffey said the firms had to seek a land-use variance. Initially, local officials favored keeping the land restricted to farming. "Their first reaction was a large-scale solar farm like this was just a different beast to them," he said. From the start, Tuffey said he or Brent Alderfer, the company's chief executive officer and co-founder, used a personal touch and were involved in all of the presentations at public hearings or negotiations. "We made sure we—not our hired attorneys or engineers—were the face of the project," Tuffey said. "We were the people who made the first presentations. We were the people who answered the questions. We were the ones who were back in front of them." The proposed use was unique since the township had never had to consider a solar farm before. In addition, its zoning ordinance did not have a classification for solar-powered generation facilities, which meant the use was neither specifically permitted nor prohibited. Tuffey said Community Energy officials showed township leaders that the land could be returned to farming after the 25 to 30-year life of the solar farm, unlike other forms of development that were permanent. The solar farm was also a way to keep the land earning income for the Kreider family so they wouldn't be as tempted to sell it for urban development. "What township officials did care about is at the end of the project the land would be available to be returned to agriculture," Tuffey said. The result was a decommissioning plan and an escrow account. Community Energy was already familiar with escrow accounts and decommissioning plans because of its extensive experience with developing wind energy projects in the eastern U.S., he said. Those requirements have become commonplace with wind development. "We're not necessarily talking a lot of money because the salvage costs are pretty good," Tuffey said. "Materials like copper are not going to get cheaper in the future." As part of the proposal, Community Energy agreed not to make major grade or contour changes or use concrete around metal posts. The firm also agreed to not remove topsoil and to plant a cover crop that would minimize soil erosion. Landscaping also had to be installed around the perimeter. In addition, Community Energy Solar had to agree not to propose another solar farm within the township. The original proposal was for a 15 MW project to be built in phases. Because of the tight confines of the farm, the only way to achieve 15 MW was with single-axis tracking. But Community Energy's Steve Hazel said East Drumore Township leaders were more comfortable with the idea of not having moving parts on the site. So developers settled on 5 MW using fixed tilt, with an option to expand in the future. GroSolar acted as the general contractor on the Community Energy project, which involved about 20,700 MaxPower 290-watt modules from Canadian Solar Inc. Fifteen inverters from Advanced Energy Inc. convert the DC power to AC before feeding it into the PPL Electric grid. Eventually, the township issued a conditional permit with what Tuffey described as "pretty straightforward" requirements. Obtaining financing for the project took about three years, much longer than originally anticipated. In the beginning, Solar Renewable Energy Credits were about $325 in Pennsylvania and $600 in New Jersey, Tuffey said. Later in the process, the SREC market had crashed to $50. "We watched those SRECs decline in Pennsylvania to below $50," he said. "In an environment with that big of a revenue element decline, it's tough to get people to buy in. "We put three years into developing, and it took just a little over three months to build it. The challenge of developing it is how do you put the pieces of financing together, particularly who is buying the power." Exelon Generation was the wholesale power purchaser under a 15-year power-purchase agreement, but additional help was needed with SRECs. Because of the high cost to produce solar power, Community Energy developed a hybrid product called PRAXIS Green Power. It's a combination of Keystone Solar RECs and national wind paired with educational modules called "Building Keystone." The modules, which feature videos of project construction, are designed to expose students to the science behind renewable energy and possible careers in the field. "It was the ‘Building Keystone' and a desire to assist a project that really made the difference," Tuffey said. So far, several educational institutions, including Eastern University, Franklin & Marshall College, Drexel University, Juniata College, Marywood University, and Millersville University have purchased voluntary SRECs. Professional baseball team the Philadelphia Phillies has also signed on. In fact, the team's mascot—the Phillies Phanatic—was at the Turn on the Power Party this past October, which celebrated the project's completion. 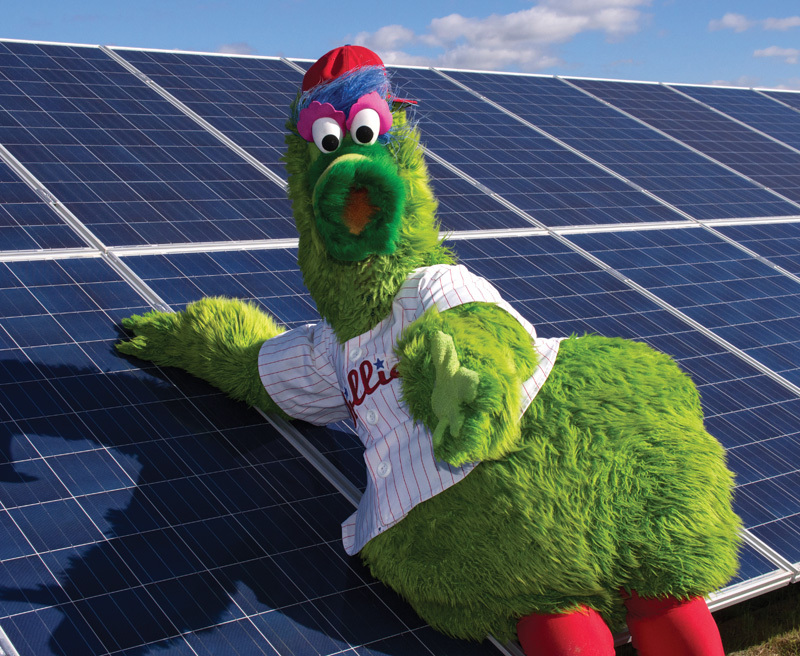 Not a newcomer to green energy, the baseball team has been purchasing renewable energy credits since the inception of its ‘Red Goes Green' program in 2008. The team remains the largest buyer of renewable energy among all 30 major league baseball teams. "This is a great initiative for the ‘Red Goes Green' project because it's local," Mary Anne Gettis, the Phillies' manager of marketing initiatives, said in a news report on mlb.com. "So we can actually say that we're buying local solar, which is pretty amazing, and it's great to be a part of it with Community Energy." After nearly three years to develop the project, construction was scheduled to be completed in just three months. GroSolar acted as the general contractor. Community Energy went with the Vermont firm because it had just completed a 1 MW project down the road, and Tuffey said they were impressed with its people and detail-oriented work. "Seeking to build a project like this in three months is moving very, very fast," Tuffey said. "GroSolar did a terrific job because we wanted to get it online." The project involved about 20,700 MaxPower 290-watt modules from Canadian Solar Inc. Fifteen inverters from Advanced Energy Inc. convert the DC power to AC before feeding it into the PPL Electric grid. Both of those major equipment suppliers stepped up to the tight time constraints on delivery and project completion, Tuffey said. GroSolar selected a ground-mount system from Schletter Inc., and the panels were fixed at a 25-degree angle. All the delivery deadlines had to mesh with little room for slippage, to keep the project deadline on track—and all vendors stepped up to the challenge, Tuffey said. Local township leaders were more comfortable with the idea of not having moving parts on the site, so the developers went with a fixed tilt approach on the Keystone project. As part of its proposal, Community Energy agreed not to make major grade or contour changes or use concrete around metal posts. GroSolar went with those suppliers because they were all "top-tier vendors." "We bid the equipment and liked the terms, prices, and availability to meet the tight schedule," said Community Energy's Steve Hazel. "We've since used this combination on two other projects to our satisfaction." The racking and solar panels were installed on driven posts without concrete to avoid soil disturbance. The 89-acre solar farm is planted in a"no-mow," deep-rooted cover crop that's used as a windbreak in the west. Not only do the cover crop's 30-inch roots help minimize erosion, but about 30 percent of the roots die every year, decomposing and increasing soil biomass. Over the life of the project, the cover crop will actually build up the soil and improve it. "This is something that does more than just rest the soil," Hazel said. 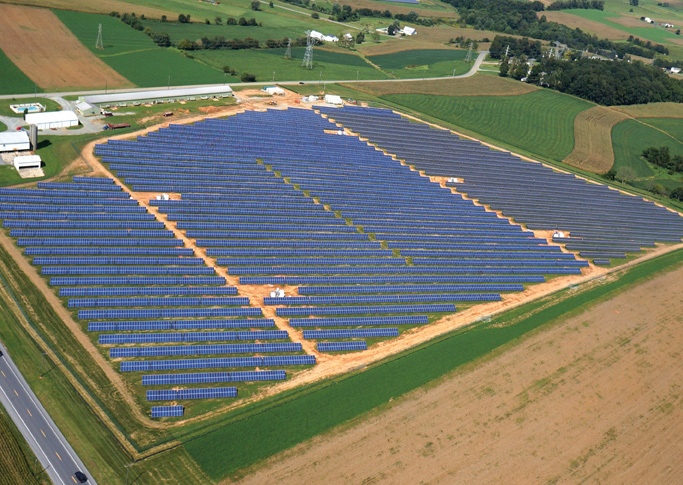 At the time it was completed, the Keystone Project was the largest PV installation in Pennsylvania.